It was time now for us to move towards Ratnagiri to explore the second fort for the day. Since the fort of Ratnagiri was about 10 km from Bhasmangi, we could reach in just about 20 minutes driving across the rural roads. Ratnagiri is surrounded by three hills with intact fortifications. We inquired the route to the base of the hills and decided to explore the main hill. A shepherd at the starting point of the trek informed us about Ratnagiri being a seven tiered fort and spread across three hills, which sounded quite interesting. 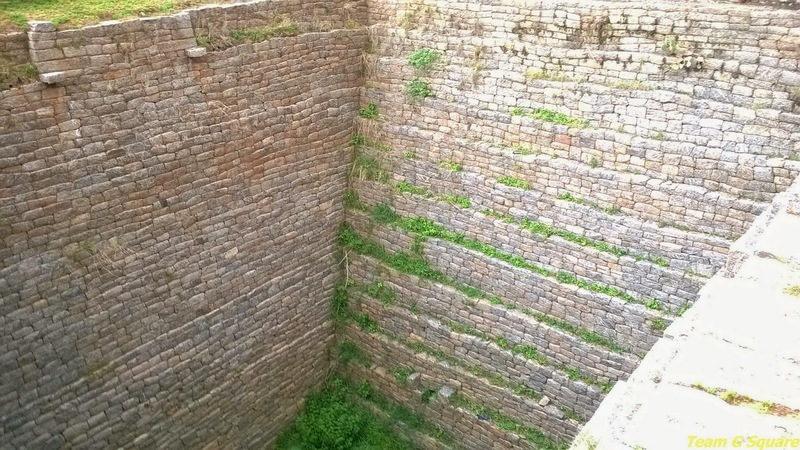 There are many Kalyanis or stepped tanks at the bottom of the hills which probably served as the main source of drinking water for the erstwhile residents of the fort. 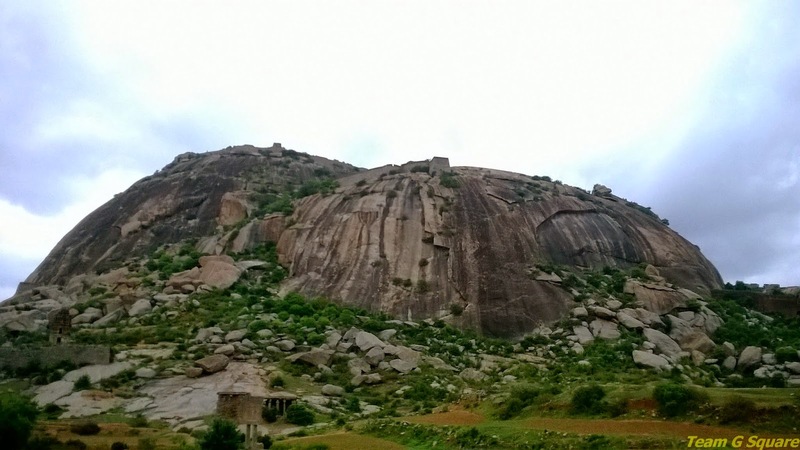 We were unable trace much of the history related to this place, though we were sure that the fort had connections with the Vijayanagar kings and Tippu Sultan. Unfortunately, this fort was plundered by our generations in search of fortunes assumed to have been left by Krishna Deva Raya's kingdom, after the news of finding fortunes in Sree Padmanabam Temple in Thiruvananthapuram Kerala broke out. 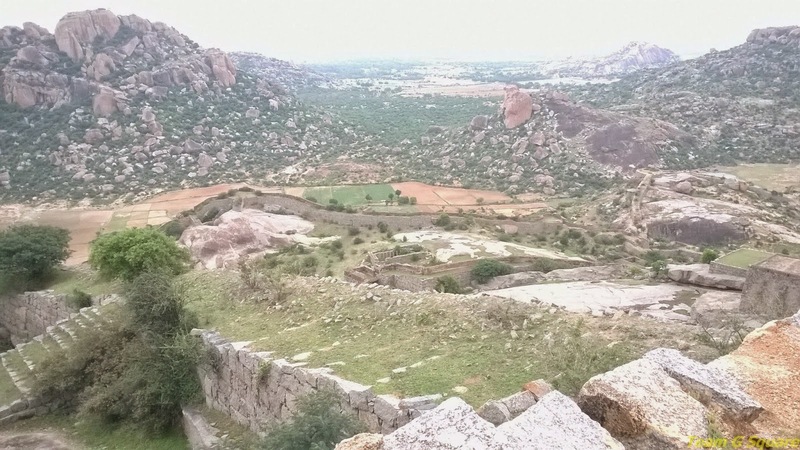 Sadly, many forts in Andhra Pradesh have been vandalized by people in search of fortunes owing to the misconception regarding the treasures left behind by the kingdom. The ascent up till the first tier was difficult due to the absence of a particular trek route. Once we crossed the first tier, the climb was comparatively easier as there were steps laid all along. We came across numerous water collecting ponds inside the fort. At the sixth tier, was a beautiful temple that stood to tell the act of vandalism. The rock cut steps leading us to the last tier reminded us of the Fort Midigeshi . 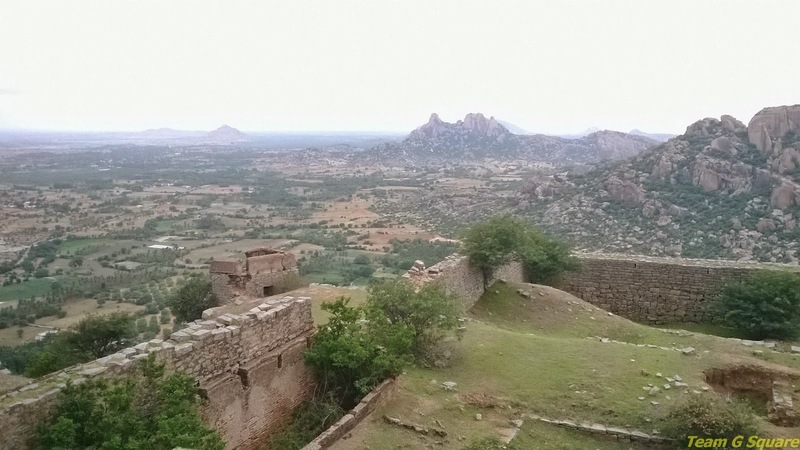 The last tier comprised of an amazing two storeyed gateway and enclosed many ruins.After resting a while due to our tiresome ascent, we started our descent which was equally tiresome. What an amazing place!! It is so sad to see the vandalism but there is still so much beauty and so much history! Terrific captures!! What a wonderful trip!!! Thank you so much for sharing the beauty and the history!! Wow! Despite having passed through Ratnagiri, never notice the existence of forts there!! Thank you for sharing! Wonderful post... photos are good... One suggestion... can you change 'Padmanabam Temple' to 'Sree Padmanabhaswamy Temple'. Looks majestic. Nice to know about this fort. It's a shame that the temples in this fort have been vandalized. Too often our history is destroyed by our greed. I'm glad you were able to make this trek and got these wonderful photos to share with us. You are always covered such fantastic place, and the temple is just wonderful looking! nice post, that mating beetle shot is amazing btw. what a beautiful site! sorry about the vandals, though. Great! Got to know of this place. I like how you capture critters too along your journey. What a fascinating place to explore. Great shots.